Daily Mirror - Zionism’s undoing; the aftermath of the Balfour Declaration. Zionism’s undoing; the aftermath of the Balfour Declaration. Even former US president Jimmy Carter who single-handily (without much Jewish appreciation) did more to make Israel secure than any other living person confesses neither he nor anyone can change the march of demographics. Within the boundaries of the Holy Land there are just over six million Jews and six million Palestinians. The Palestinian birth rate is almost three times that of the Israeli Jews. If anything the Jewish population is starting to fall as an increasing number of Jews decide that Israel has no future for them and emigrate. 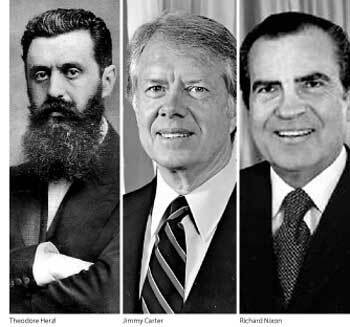 Herzl, a broad minded man, was happy to think of the new Israel in Argentina which had a considerable Jewish migration in the nineteenth century and was well away from the clutches of anti-Semitic Europe. He was also inclined to accept the offer of Joseph Chamberlain, then the British colonial secretary, for a site on the Uasin Gishu plateau near Nairobi in what was then British East Africa. The Zionist Conference overruled him. When the British government, Palestine’s ruler, gave into Zionist lobbying and in the words, of the Balfour Declaration of 1917, favoured “the establishment in Palestine of a national home for the Jewish people” the only Jewish member of the cabinet, Edwin Samuel Montague, denounced the whole project as a reconstruction of the tower of Babel. “Palestine”, he said, “would become the world’s ghetto”. Lord Curzon, the former Viceroy of India, observed that Britain had “a stronger claim to parts of France” than the Jews did to Palestine after two millennia of absence. He denounced it as an act of “sentimental idealism”. But unmistakably this is the direction events and demographics are moving. Probably the best thing that outsiders can now do for Israel is to stop trying to help organize the creation of a two state solution and let the Israelis themselves look the Palestinians in the eye, as the demographics bite. If the white South Africans can do it so can the Israelis. But unmistakably this is the direction events and demographics are moving. Probably the best thing that outsiders can now do for Israel is to stop trying to help organize the creation of a two state solution and let the Israelis themselves look the Palestinians in the eye, as the demographics bite. If the white South Africans can do it so can the Israelis. If this became the solution the Israelis would find that the only thing that most Palestinians would now want is a prosperous, capitalist economy that lives in peace with its neighbours. The Jews would not be driven into the sea. But those who wanted to return to Europe, America or even Russia would be more than welcome. Both Germany and Russia, the great centres of anti-Semitism in the past, have seemed to have flushed that horror away, and treat their Jews well. The Jews should never have tried to turn back the historical clock by returning to Palestine after fleeing in AD 70. But now they are there in such significant numbers their only solution is to honour the rest of the text of the Balfour Declaration. “Nothing should be done that may prejudice the civil and religious rights of the existing non-Jewish communities in Palestine”, it said. This was the British condition. The Israelis have long overlooked this. If they go on overlooking it they do so at their peril. For 17 years the writer has been a foreign affairs columnist and commentator for the International Herald Tribune/New York Times.